Kalguksu is an everyday favorite for many Koreans for its simplicity, frugality, and ability to keep consumers full. Literally meaning “knife-cut noodles”, sheets of flour-based noodles are rolled out and cut to make the plump noodle dish which are cooked in stock. The most popular and well-known soup stock for kalguksu is one that is seafood-based and usually made from dried fishes, clams (a popular variety is manila clams or “bajirak”), radish, and other common and inexpensive ingredients to maximize flavor and volume. It is, in essence, an everyday commoner dish but a second variety of kalguksu exists in which the traditional main consumers were the yangban, or those from the wealthy and elite class. And in Seoul, the restaurant I’m introducing you today is one of the most famed in the capital for this other variety of kalguksu. Jeongdong Guksi is located in the charming Jeongdong district of Seoul, just to the west of City Hall and where Deoksugung Palace, the Seoul Museum of Art, Jeongdong Theater, and various other important historic and beautiful buildings are located. A simple sign at the entrance leading to the basement of the building housing Jeongdong Guksi could clearly be passed by anyone in the neighborhood. But the staircase walls inside plastered with celebrity autographs and newspaper clippings reflects the pedigree and popularity of the restaurant (as does the wait lines at times). The draw, as the restaurant’s name implies (“guksi” is a dialect word for “guksu”, meaning noodles) is the kalguksu here which has no seafood in it but is made purely from beef stock. This other variety of beef-based kalguksu was traditionally mostly consumed by the upper-class of Korea’s society as beef itself was (and still remains) an expensive ingredient in mountainous Korea. The Andong region, in Gyeongsangbukdo of southeast Korea, used to be the home for a large community of the upper class which is perhaps why the beef-based kalguksu is often referred today as “Andong guksi” or “Andong guksu”. Under this same tradition, Jeongdong Guksi makes an enormous vat of their popular beef broth every day in which they throw in bones from Korean beef (hanwoo) with other ingredients to simmer and boil for over 10 hours until a milky-white and rich broth is created. This serves as the important backdrop to their three main dishes of noodles, dumpling soup, and spicy beef soup (gukbap). Jeongdong Guksi’s interior is simple with mostly sit-down tables. The menu is also not much more astounding. The Jeongdong kalguksu and manduguk are both 8K, and are the main stars of the restaurant as a whole. Another popular favorite is the Andong gukbap which is a hearty beef-based soup with a slew of beef and vegetables in a slightly spicy and savory broth and served with rice (9K). A plate of their handmade dumplings is 6K while, in the summer seasons, they serve a special black bean and buckwheat-based konguksu (8K). Additional servings of rice bowls are 1K each. Also on the menu are a few dishes meant to be enjoyed with drinks (anju). These include the jeon assortment which can be ordered in full (29K) or half servings (14K), bossam (29K), sooyook (33K for large, 22 for medium), etc. Standards of soju, makgeoli, and the likes are all on the menu for 3-6K a bottle. The restaurant prides itself on using Korean-sourced ingredients. Their sign shares how their beef, pork, rice, lettuce, and such are all from Korea. Sides are quite simple at regular kimchi and kkakdugi. Both are crisp, fermented just enough with the right level of pungency and spiciness. It is a bit bolder in taste, perhaps to match the depth of the rich soup stock and there are even folks who purchase the kimchi here for their own consumption because they are such fans. The Jeongdong kalguksu comes in a large bowl in which noodles, meat, chopped green onions swim together in the beef broth. The hand cut noodles are plump and with just the right amount of bite to hold its own against the deep soup. Having extracted all the goodness from the bones and marrows of the beef bones, this is lip-smacking stuff that’s sure to put some oomph in your stomach and bones. I have to say though that my preference over the kalguksu here is the manduguk (dumpling soup). The dumplings here are made fresh in-house everyday where the wrappers are filled with minced meat, diced onions, and other fragrant ingredients. They’re lovely on their own but especially more so when eaten with the soup. Take a dumpling, cut it in half, place on soup with a bit of soup underneath and top with a piece of kimchi to really get that harmony in flavor and texture down. Which goes to say that the big draw and thing that brings everything together here is that laboriously prepared stock. Stock is life in Korean cuisine and, when paired with fresh and well-prepped ingredients, what you have is solid, down-to-earth, homely Korean food that’s hard not to like. Jeongdong Guksi labors hard to make good, solid food. 8K may sound like a lot for a bowl of noodles or soup but when taken into account the tedious and meticulous work that goes into making everything from the stock to dumplings and using Korean-sourced ingredients, this is homely food which anyone- yangban or not- can enjoy. 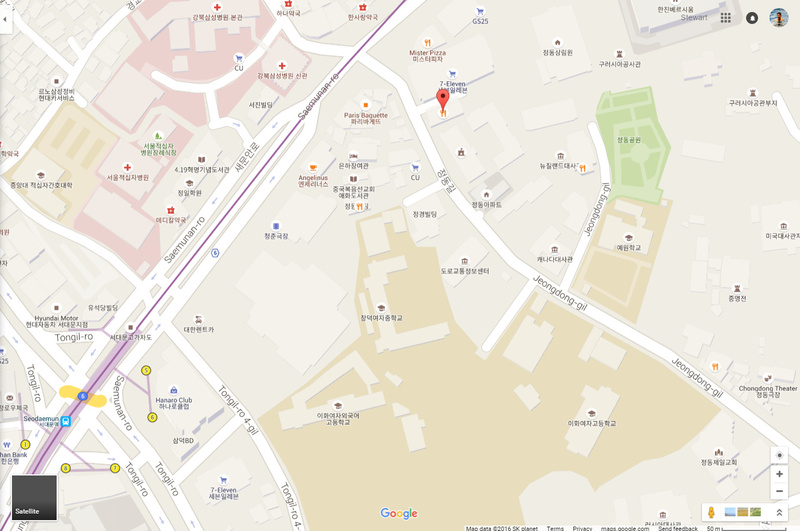 Come out of exit five of Seodaemun station and walk straight for about 250 meters. Turn right on Jeongdong-gil and walk about 50 meters until you see the entrance on your left. Their website lists that it's possible but I haven't seen a lot. You may want to call and ask. All standard Korean liquors available. Jeongdong Guksi is closed only on holidays. Their menu, including soups, can be ordered for take out which are expertly stored. Their kimchi also has enough fans that people order it. Here I am in Seoul again, Stewart, and this time I have eaten the manduguk at Kkangtong Mandu and the kalguksu at Jeongdong Guksi. The mandu and the noodles were as well-made as you said they were, but it was the beef-based soups that really hit the spot for me. Actually I was going to try the Andong gukbap, but decided to save my gukbap experience for Bisaebeol tomorrow. Your recommendations are great, thanks so much!